Foundation issues with your home should be addressed as soon as possible. Whether it’s a visible crack on the wall or an unseen structural threat, you should get the issue fixed to prevent bigger and more expensive issues in the future. Van Matre Construction aims to help you ensure your home’s safety and preserve its value. Foundation settlement and cracking can lead to major structural problems that a DIY approach just can’t fix. Severe drywall cracking and surface distortion require the skills of a basement foundation contractor. These professionals will come up with a cost-effective solution for you. Van Matre Construction, LLC is a house foundation crack repair company with extensive experience helping Colorado residents strengthen their homes. We address the problems that arise from issues, such as vertical movement, horizontal movement, and wet basements. Our team has fixed old and new homes in Denver, making them a safe and stable place to live in. What Causes Cracks in Your Concrete Walls? The unpredictable weather in Colorado — which include the frequency of storms and earthquakes — and the presence of expansive soil make the state’s properties being more susceptible to foundational cracks. The soil often affects areas like Front Range and Eastern Plains, causing problems like settlement and horizontal movement to crop up in Denver homes. These issues could, in turn, put pressure on your foundation. As a Colorado homeowner, you need to keep an eye out for expansive soil in areas like the driveway, interior walls, and basement floor. Environmental conditions can, furthermore, weaken the structure of your home. These include frost heaving and lensing — the by-products of cold climate — that could put a strain on your foundation. These events would necessitate house foundation crack repairs. On a similar vein, the intense summer heat could also dry out the soil around your home and weaken its walls. 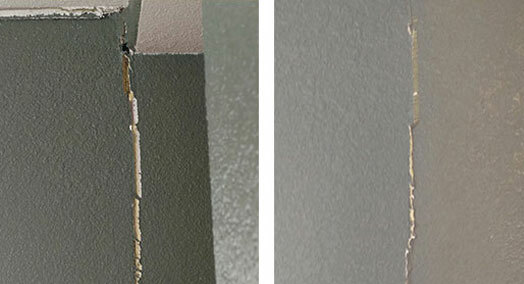 Weather and soil conditions are not the only things that could compromise your home’s drywall. Recently built homes can suffer from structural problems, too. Factors, such as poor drainage, unstable concrete, pest infestations, vertical movement problems, and a lack of maintenance, can all contribute and cause your basement and foundation to crack. When a house’s foundation settles, the framing moves with it. Drywall and plaster quickly crack with very little foundation movement and can give an indication of how a house’s foundation is moving. These cracks commonly show up at the corners of rooms, windows, or doorways. If it is a new home, and you see a few hair-line cracks, this is typically indicative of normal drying of lumber and is nothing to worry about, however the crack should be monitored. If the home is more than a few years old and cracks are growing larger, this can be a sign of foundation movement. Brick and other masonry quickly shows the affects of movement. Masonry’s rigid nature, relatively weak shear strength/mortar bond will quickly alert you if your foundation is moving. If your home has brick, look for stair-step cracks, vertical cracks, or where the brick appears to be pulling away from the wall. Hairline cracks typically do not require immediate action but should be carefully monitored for future movement. 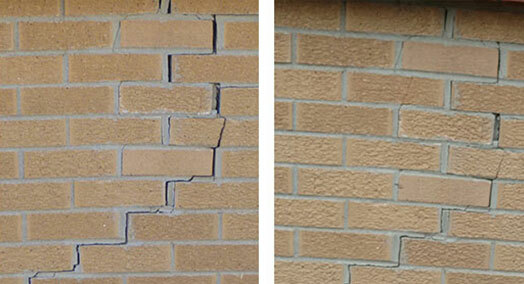 If the cracks are bigger than 1/8”, or seem to be growing, you should contact VMC for a free assessment. It is important to distinguish between framed floors and concrete floors poured on grade: If your framed floor is out of level to the point where you notice it, it could be due to vertical foundation movement and you should call us for a free assessment. In Colorado, many homes were built with slab-on-grade basement floors: these floors are concrete poured directly on top of the basement soil and the slabs tend to be independent of the foundation. If your slab is moving a little, that is to be expected. If your windows or doors used to open and close easily and are now tight or rubbing, you could be experiencing foundation movement. Contact Van Matre Construction for a free assessment. Van Matre Construction is a dedicated foundation repair company. Our experience, expertise, and cost-effective solutions allow us to complete each project on budget and on time. We can work on foundation problems caused by vertical and horizontal movement, inadequate drainage, and other similar situations that threaten the stability of your home. If you need an interior or exterior foundation drain, cut-off drain,a surface French drain or have other drainage needs Van Matre Construction can help. This process injects grout mixture into the space beneath the foundation, and corrects the foundation’s leveling. It’s an affordable option, but one that isn’t always right and will be ineffective against shifts and settling. 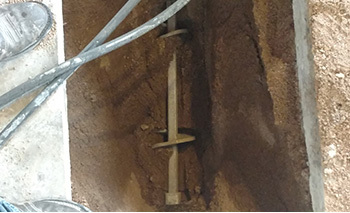 Placed around the foundation, helical piers allows us to bury deep down the layers of soil to find solid footing. This offers a permanent solution (if done correctly) to a foundation problem. More commonly known as horizontal movements, this event occurs when the soil underneath your house expands. It’s imperative to address walls that are bowing in due to lateral movement. If your foundation is heaving upwards or settling, Van Matre Construction has the solution. Depending on your soil type and how the foundation is moving, VMC can design a reliable, cost-effective, permanent solution. Call Van Matre Construction or fill out our contact form today. If your windows or doors used to open and close easily and are now tight or rubbing,you could be experiencing foundation movement. Call Van Matre Construction for a free assessment.